The SFA Judicial Panel ruled on Monday that the original SPFL Board decision - annulling the results of a win over Albion Rovers and draw with Queen’s Park and awarding 3-0 wins to Clyde’s opponents - should stand. The punishment was imposed after the Bully Wee fielded Declan Fitzpatrick, recalled from a loan spell at Clydebank. The decision means Clyde go into their final three League 2 games still four points behind leaders Peterhead. And in a lengthy statement on the club website, Clyde described their punishment for ‘an honest mistake’ as unduly harsh. They said: “We are very clear that, in fielding an amateur player who had yet to appear in a senior football match, we were not seeking to gain a competitive advantage. The statement added: “Whilst the SPFL accepted that the mistake was an honest error and an oversight, the sanction, we believe, was severe and did not appear to be consistent with previous decisions regarding player eligibility. Earlier this season Hearts still took a point from a Betfred Cup game they won after being docked two points for fielding an ineligible player. And in 2014 Peterhead - of all teams - had a match with Ayr United replayed “in the interests of sporting integrity and fairness to both sides” after similarly breaching the rules. “While the club accepts the deliberation of the SFA Judicial Panel and recognises their jurisdiction in this matter, we remain disappointed with the final decision. “Following the decision of the SPFL Board sub-committee on 8th March 2019, the club decided to appeal the sanctions imposed. The appeal was focused on the excessive nature of the sanction arrived at by the sub-committee. “Clyde FC has at no stage denied that it inadvertently breached Player Regulation 65 and Player Regulation 16 and Rules F1 and F2 in the matches against Albion Rovers and Queen’s Park on February 16th and 23rd respectively. As soon as notification of the breach was received the club immediately apologised, withdrew the player from the first team squad and accepted that a breach had occurred. “We are very clear that, in fielding an amateur player who had yet to appear in a senior football match, we were not seeking to gain a competitive advantage. 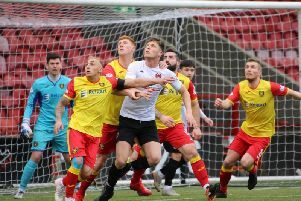 “The Temporary Transfer of Declan Fitzpatrick was cancelled on 15 February in order to allow him to return to Clyde, his home club, to deal with an injury crisis (three first team forwards were injured). “This was the first Temporary Transfer processed by the club following the overhaul of the Temporary Transfer regulations in 2017-18. “The initial Temporary Transfer and its cancellation were done in full sight, and approval of, the SFA. “The SPFL discovered, and notified, the breach to the club ten days after the SFA were advised of the cancellation of the Temporary Transfer and after two matches had already taken place. Whilst we recognise and accept that the properly administered registration of players is the bedrock of the game, we were nonetheless extremely surprised and disappointed to learn that the SPFL do not appear to place a priority on checking teamlines – a mandatory submission - on a weekly basis. On the basis that we were unaware that a rule had been breached on 15th February, and in the absence of any notice to the contrary, the inclusion of the player for the match on 23rd February would inevitably compound the breach. “We accept that to be part of senior football, part-time clubs have exactly the same regulations to comply with as any full-time club in the game, but this is achieved with a tremendous disparity in resources. Normally this is a challenge met but on this occasion the club fell short due to an honest mistake and oversight. In our opinion, the sanctions imposed by the SPFL did not recognise these pressures. “Whilst the SPFL accepted that the mistake was an honest error and an oversight, the sanction, we believe, was severe and did not appear to be consistent with previous decisions regarding player eligibility. “As recently as earlier this season we noted that the SPFL administered a two point deduction when Premiership club Hearts fielded an ineligible player in a Betfred Cup tie won by the Edinburgh club, with no overturning of the result. That particular SPFL sanction resulted in Hearts accruing a point from a competitive game in which they fielded an ineligible player. “We note that the SPFL acknowledged at both the hearing and the appeal that they failed to highlight that an ineligible player had been included in the teamline for the Albion Rovers game before the second game took place. This admission was included in our appeal submission as one of the club’s mitigating factors. “We are ultimately left with a sense of an unduly harsh punishment being imposed on the club by the SPFL. The disappointing news today does not alter our opinion, but we have no option now but to move on. “To conclude, the Board and staff obviously deeply regret this matter and apologise to the players, management team and supporters. “The supporters have given the club tremendous backing throughout this period, the players have responded brilliantly and the leadership of the management team has set them apart. This united effort has been remarkable and has seen us continue to challenge at the top of League 2.